Listen to the breeze of the whispering trees while lounging on the oversized front porch showing off its cypress ceiling as it welcomes you to open its oval wooden front door. 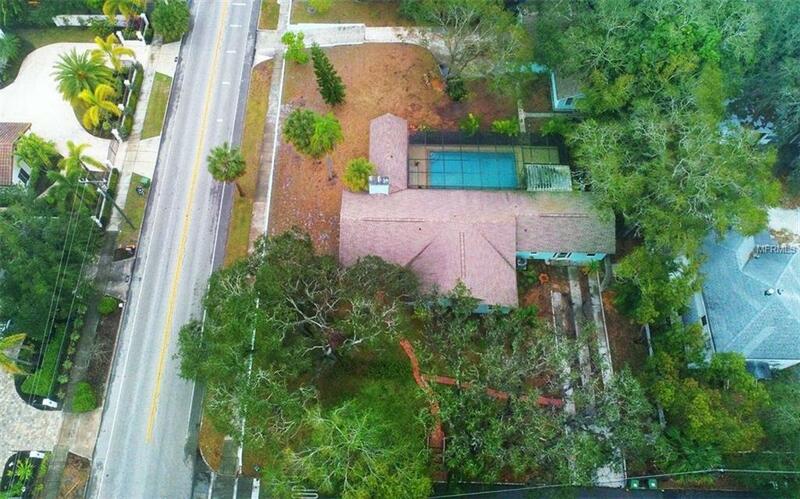 Step inside this open split floor plan before you think about the possibilities presented by the huge lot this house sits onalmost a full 1/2 acre. Which could be utilized as either one large estate-sized lot or two separate buildable lots. Once inside youll be surprised by what this residence offers in its 3BR/3BA home along with two rented studio apartments, one attached that is 600 SF currently rented for $800.00 a month and a detached unit currently rented for $600.00 a month. This home features a welcoming living/family room with beautiful volume wood ceilings, a wood burning fireplace, adjacent a sizeable dining room that leads to a galley kitchen, showcasing, wood oak cabinets, granite countertops, two-bay farm- style sink and glass tile backsplash. Play hooky and work from home in the large office/den with amazing natural light. Genuine wood flooring throughout most of the home along with tile bathrooms. Entertaining is a breeze at the oversized caged heated pool, along with a natural gas grill hookup for barbecuing. Newer air-conditioning (3 years old, one zone four tons, filter grills in all rooms), huge yard, freestanding 3 car garage and irrigation well. Ideally located and VERY convenient to downtown, dining and entertainment, the bay front, beaches, Southside School, Southside Village and Sarasota Memorial Hospital.